ROCK PUSHING-FAIR LADY AT SHUTTLE-FIRE FIST. It is a common practice to compare martial arts by their differences. 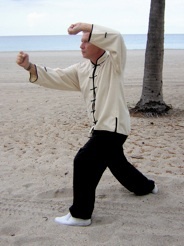 In this discussion I would like to compare movements from three arts TKD, Tai Chi, and Xing-yi, by their similarities. I am not trying to say that the movements are completely identical—at least in the way that we perceive them, but that by looking at how each art emphasizes a different aspect we can gain a greater understanding of how each arts focus can help us in our own. The applications feed into each other much more readily than most would realize, or that various practitioners would even admit. To describe in detail the dynamics of each motion is far beyond the scope of this discussion, indeed it can involve years of study. I am going to try to get the basics of each across. Rock Pushing (Bawl-Milgi): this movement is from the WTF poomse Sipjin. It consists of both hands starting from the waist of the opposite side and rise with a pushing motion, palms forward (slow with tension). Commonly described as either an internal power generator (Chi-Kung type), knocking aside something like a jumping sidekick, or just pushing something away. 2.Fair Lady at Shuttle: In this movement as the body turns at the waist and the weight shifts forward, the lower arm rolls upward to above the head, palm facing forward. The other hand moves straight, palm open and front facing in what we would call a palm heel strike. Note that just before impact the palm “sits” (i.e. extends sharply, exposing the heel of the palm). The movement is designed to rotate the body of the incoming attacker so that he has lost his stability, at this point the defender can either push or strike with the straight palm. In either case the defender will usually go flying. It is important to note that the Tai Chi practitioner is primarily using his postural/structural integrity not his muscular strength to achieve this. The attacker has the feeling that he walked into a solid object that has somehow slid past his attack. 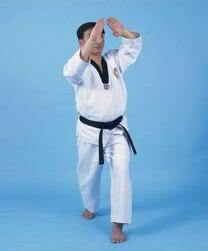 3.Fire Fist: One of the five basic fists of Xing-Yi: in this movement the feet come together and the body is launched forward, usually on a diagonal. At the same time the forward had rises and performs an upper sweeping motion, which we would call a high block. The bottom hand strikes its target with a vertical fist. All of these motions occur simultaneously at great speed, and the contact is made before the attackers weight is fully grounded. This ensures that all of the mass of the defender is directed into his attack. Immediately the defenders rear foot with a quick hopping stamp, returns to its original posture, thus allowing the attack to be quickly relaunched if needed. 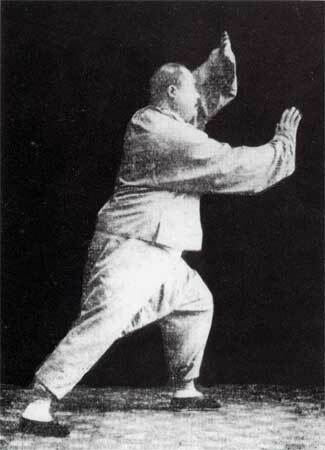 It is this staccato like continual motion that gives Xing-Yi its unique flavor. The effect is like having a giant boulder crashing into you. So where do these examples lead us? I started off by saying that all of them feed into each other in many ways, but as TKD practitioners do we ever take the time to look at other arts and re-interpret what they do in light of what we do? Could we not take that movement from our form and by changing our intent make it work as it does in those other arts. Wouldn’t our “vocabulary” of applications be increased? I have heard many arguments on “stylistic purity”, “traditional versus non traditional”, “It’s not Korean”. It is my personal opinion that almost all of that kind of thinking is nonsense. Nothing ever existed in a vacuum, everybody used whatever worked for them, and it really never mattered where it came from except in some Kung Fu movies. Does this mean that the basic syllabus of a given style should be ignored and techniques grabbed from anywhere? No, techniques are not principles. I believe that one has to have a grasp of the principles of any art. Only then can you really begin to interpret how the principles are applied in another.